Anti Fed Ed Warriors, as we begin our last week of Feb. 2019, let’s look a bit deeper into the UNAI (United Nations Academic Impact). I first revealed this group, last week, in my post about “Good Job Vs Bad Job”. As I stated in that article, the ‘academic impact’ is an elite project to usher in the SDGs (Sustainable Development Goals) all over America. The UN also has many partnerships with academic institutions all over America. These “Partner Schools” have ongoing UN agenda items to complete, including the SDGs. Warriors, also in that original article I was expressing concern over President Trump’s support for the UN. That concern should be ever before us, as a nation, as long as ANY federal leader continues to support the United Nations. It’s an anti-USA organization! ICYMI: Early Feb. 2019, the Presidential proof of his support for STEM and U.S. Congressional STEM legislation. Now, we’ll look at the latest person to be nominated as the US Ambassador to the UN, near the end of this article. First, I’d like to share a couple of ‘extra special’ UNAI groups. Headquartered in New York City, NY (*Note: a large portion of the UNAI groups are based in NY), this group conducts a large amount of ‘business’ around the world. Below is a screen shot from the Post Conflict Foundation. I’ve contrasted it with U.S. Senate Bill 116. While this UNAI group is headquartered in NY, it appears almost no American activity is taking place. Will that change, as similar as S 116 is, to the overall mission of the Foundation for Post Conflict Development? We’ll need to see. Since the Foundation is so devoted to the SDGs, we know that’s a definite tie to America. How? America’s totally on board with the SDGs. One last note about this Foundation, an exclusive on-line education portal is in the works. The portal will be accessible to the US. The focus ? Peaceful resolutions. In American education, that translates to SEL (Social Emotional Learning) components. Below, an older screen shot (2018) from my blog showing the many different ways SEL is embedded in ESSA (Every Student Succeeds Act). ESSA will tie to S 116, if made into law. Headquartered in Chicago, IL, this Institute is an INGO (International Non-Government Organization). As such, it’s an IL based non-profit group. Warriors, before we look at what WEI does, let’s take a moment to understand what an INGO is. We’ve known for quite some time the supposed importance of NGOs (non-government organizations) in America. In education, they’ve been part of the massive overreaches. Across the globe, other countries have used these groups as well. However, with the UN/UNESCO driven shift to one-world-everything, this is where an INGO enters. NGOs are proving to be useless and dated in the modern era of world-wide finance and technology. International non government organizations are the answer. I kid you not. Warriors, we’ve all seen those annoying Facebook ads, right? Well, in the last 2 weeks I received one about “Early STEM Exposure Through Career Focused PBLs (Project Based Learning)”. The blurb included a description of the ability to transform traditional K-12 classrooms to PBLs. The purpose? Exposure to STEM concepts/careers as early as kindergarten via Defined STEM. The organization hosting the ‘early STEM‘? Defined Learning, LLC. Defined STEM is a portion of Defined Learning, based in IL. If you’d like to learn about the Defined STEM PBLs, go here. If you doubt PBLs are CCSS, or that CCSS and STEM are connected, look below, then read this. As you know, Warriors, STEM is the chief tool of choice (of the UN’s) to use against the US to infiltrate the SDGs as change agents in education. Why change America? Ah, that’s the $64 million dollar question..with a free researched answer. The purpose is to mind-numb Americans for a 100% global citizenship agenda. As you read, starting as young as kindergarten. I’ve written previously (2015) on the federal level STEM push for PreK and K. Believe it or not, it tied to the American Import/Export law. What you see below, is from that 2015 article. Warriors, the Washington Post recently announced that Kelly Knight Craft has been chosen by President Trump to be the newest UN Ambassador for the United States. Her connections to President Trump: mega dollar campaign donation and a 2017 nod for US Ambassador to Canada. Her connections to Sen. Rubio (FL), campaign donations. Rubio’s connection to STEM? Current DC Legislation and previous ties to the CCSS Machine. ***So, Warriors, should we be concerned how much globalization Craft will bring American education? I believe so. My thanks to Alison McDowell, who helped provide the following leads. 1) Craft’s hometown of Glasgow, KY is near the Strive Together/Lumina ‘cradle to grave’ hub. 2) Craft can be tied to her local Chamber of Commerce, KY’s Chamber of Commerce, VP Mike Pence ( a huge CTE, Career Tech Education supporter), and Gov. Matt Bevin. What’s troubling about Bevin is he reportedly was against Common Core, but has fully embraced STEM. (*Note: back in 2015, the KY Governor intended to rid KY of CC. Yet, in 2019, it’s firmly in place.) Want a disturbing look at Bevin’s priorities (where you’ll find a big ‘shout out for making KY an ‘epicenter’ for parts of STEM, as well as workforce based education)? Visit his website. 3) She’s a grad of University of KY, too. KY houses the National Center for Innovation in Education. Funding for the NCIE was provided by the Gates Foundation and the Hewlett Packard Foundation. Heading up NCIE, is Gene Wilhoit. 4) Wilhoit was influential in getting Gates to fund Common Core while he was with the CCSSO, Council of Chief State School Officers. Kentuckians Against Common Core revealed this back in 2014. You can probably tie Pence and Wilhoit together by their IN time in office. 5) KY is in the grasp of the SREB (Southern Regional Education Board). A recent SREB report on KY was almost exclusively ‘cradle to grave’ career alignment fodder. 6) During her time in Canada, Craft claimed she supported both sides of the ‘climate science’ issue. Climate science is a big part of STEM and the UN in education. Warriors, look at the picture above, then look back at the Defined STEM picture..imagine your babies being matched in Kindergarten for their lifelong job/learning. It’s not a fantasy, it’s a stark reality. STEM impacts EVERY school choice, including homeschools. ESSA increased the amount of STEM for ‘every student to succeed’. What’s worse? Your States will use this to introduce bonds (to fund education/or build new schools), legislation, or form more P3s (public private partnerships) to pull all the UN led indoctrination off! What would that look like? In 2016, I showed you how NC did this..and all on the taxpayers’ backs. The lesson to learn is that with 2020 elections in our near future, these are weapons of mass educational demise which will be used against all of us in the US. I previously wrote about the NC Connect Bond on Jan. 11, 2016. If you read that post, you saw how evidence was presented to tie the Bond to the CCSS Machine. If not, here are the main points from that post. 1) With the recent passage of the ESSA (Every Student Succeeds Act), more CCSS (Common Core State Standards), CTE (Career Tech Education), and STEM (Science, Technology, Engineering, and Math) will be present, not only in NC, but nation wide. All these are FULL of CBE (Competency Based Education). Why? Plainly stated: Workforce Necessary Skills! 2) ESSA has WIOA (Workforce Innovation and Opportunity Act), HEA (Higher Education Act) embedded! 3) The original article will show you how the plans for the big bucks will be used in some NC higher educational institutions. You will see the way the Raleigh News and Observer spun the Bond to lead us to believe the Bond is a great thing. You will see the way the Resolution by the NC State Board of Education supports the Governor’s desire for MORE CTE, Workforce Based Education. The Bond easily plays into all of this! So why should we vote ‘no’ to the NC Connect Bond? Here is my original thought. Even if you are NOT an NC resident, you can use this type of slick moves as examples of where to look in your state. With the federal overreach in education, NC is hardly alone in this type of activity. Before I continue it is vital I point out the leader of the NC Against the Bond movement is Nicole Revels. She has stood by my side fighting Common Core for quite a while. The least I can do is stand by her side as we fight the Bond. I never expected to find the CCSS Machine in the Bond, but nothing escapes the Machine in our modern times. My goal is to compliment her work, as the work of others opposing this Bond as well. I hope no matter where you live, that when you find evidence like this, you work as a team with others. Since this original post, I have found MORE evidence of how the ‘innocent Bond’ is even more tied to the CCSS Machine than I first thought! In this LiveStream video I made 3/8/16, I give you plenty of the new evidence, so I will not repeat it here. I will say up front that the video is raw footage shot in my home. It may not be professional shot or be a fancy set, but the time for polish is past us. We don’t have time for fluff. We do, however, need the knowledge. Knowledge is power we can use to fight the CCSS Machine, the Bond, or whatever else we face in the ‘War Against the Core’. I will point out that the figures I share in the video are from the Fiscal Year 2014-15. However, I also share the NC Governor’s Recommended Budget for 2015-17 ties. The documents mentioned in the video are available to whomever requests them. Since each of the 58 Community Colleges in NC are CCSS/CTE aligned, they also contain Small Business Centers. Meaning MORE P3s(Public Private Partnerships) in education reform. Something ALSO embedded in the ESSA quite a bit. It is important to note that the Federal STEM budget (which NC gets a portion of) already covers updating facilities! So why burden NC with a Bond to cover the buildings? Closely needing an answer is the question that NC already receives Federal funding for CCSS/CTE and College/Career Readiness, so why are we being asked to support a $2 billion dollar Bond for post-secondary education institutions to expand their CTE courses? Of note, not one word has been mentioned about the proprietary NC schools in all this Bond topic, but do know every one of them is sold out to CCSS/CTE and STEM. In my research the only apparent reason would be simply this: crony led education for a workforce profit. One final reminder: The NC State Board of Ed contains members from every educational level: Pre-K to Grad Schools. The Board SUPPORTS Workforce based education. Any guesses as to why we are being asked to vote ‘yes’? NC has its first “Global Ready” School. Is your state next?! Anti CCSS Warriors, another work week is upon us. Another week to fight against the agenda behind the CCSS Initiative. We know part of the agenda is NOT a true academic education, but a workforce based, globally minded, and career ready citizen who will be an economic ‘positive’. I’ve written much on the topic. Our students, regardless of the their age are being described as ‘human capital’, ‘talent supply’, and other disgusting phrases. We can now add the dishonorable ‘globally ready’ to this list, at least in NC. But are there other states already willing to sell out their schools? You bet! I invite you to enlarge the above screen shot. This is no joke for NC, but it’s a foolish move for the state, nonetheless. Why? Because instead of the state receiving LESS CCSS, it is continuing to LOCK CCSS into the schools!! 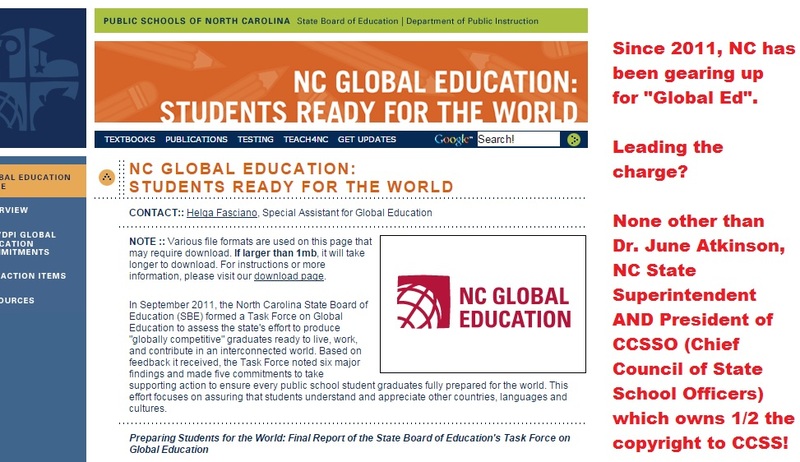 Here’s a quote from the page above, “In September 2011, the North Carolina State Board of Education (SBE) formed a Task Force on Global Education to assess the state’s effort to produce “globally competitive” graduates ready to live, work, and contribute in an interconnected world.” The Task Force found 6 major goals and committed to 5 of them. What are they? I’m so glad you asked! Below you’ll find the 6 goals in plain language, not the tricky double speak so often used in CCSS supportive dribble. The 5 commitments? Again, in plain language, not pro CCSS rhetoric! With moves like these in our states, we know LOCKING in more CCSS/CCR/CTE is a reality, not a questioned possibility. If our leaders are saying ‘no’ to CCSS, but ‘yes’ to ANY of the above, we must hold them accountable! For my return to “Would You Believe It? 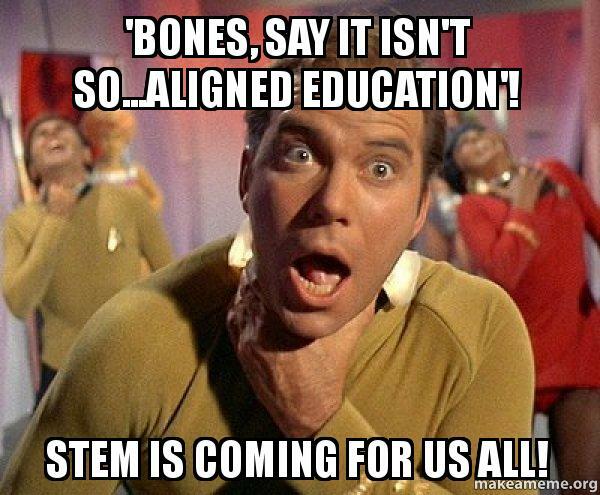 !” Wednesdays, I’ll share with you how the STEM Education Act of 2015 ties back to Common Core Standards. If you’ve followed my blog long enough, you are aware of the numerous times I’ve given you documented evidence of how STEM, STEM to STEAM, are all aligned with CCSS. 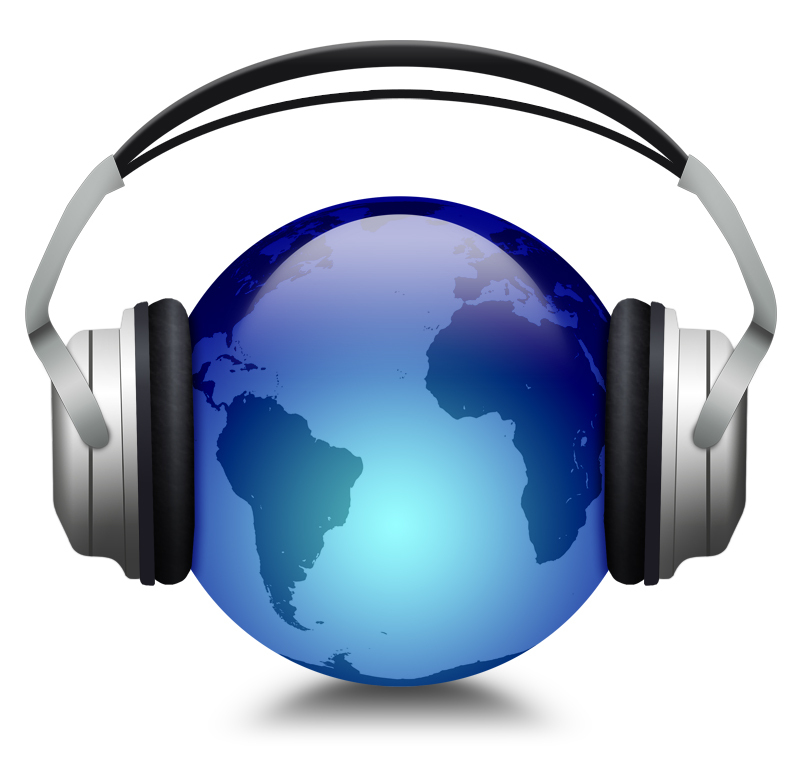 (Did you know there’s now a STEM to STREAM? (It stands for Science, Technology, R______, Arts, and Math). 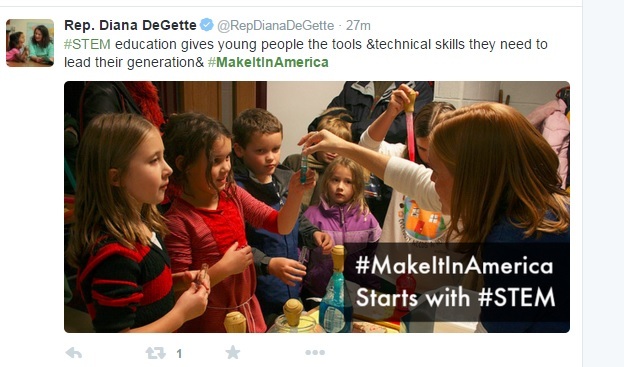 So, What is the STEM Education Act of 2015? If you haven’t heard of this new federal law, it became such on October 8, 2015. 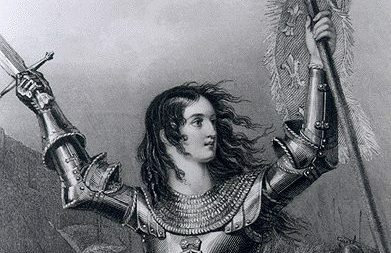 In a nutshell, the law states that STEM must now include computer science. While that sounds perfectly innocent, there’s more to this law than a simple course addition. You wouldn’t need a federal law for that. Here’s one of the ‘there’s more’ statements: “to support existing STEM education programs at the National Science Foundation.” Now, before I go on, let me clarify that this statement is only a short version, or a summary of the law. If you were to stop there, again, you’d think ”this doesn’t sound bad”. So, Where are the CCSS Connections? Their website is on you should certainly check out. Why? This agency is not only ‘big’ in education, but its ‘big’ into our communities as well. See their ‘students’ page. If that’s not enough ‘evidence’, be sure to go back and read the 3 part series I wrote about the STEM, STEAM, and CCSS. What About the Computer Science? You can also see the CSTA map of the Computer Science courses aligned to STEM. You shouldn’t be surprised to see Google and Microsoft among the sponsors, but you may be surprised that the College Board is also a sponsor. Warriors, remember, the College Board is funded by each state! Above, you can see I have given you much information about the STEM to STEAM shift. But STREAM?? If we look at the EdWeek article, notice the ‘R’ could stand for ‘religion’, or ‘reading and writing’, etc. Is there a more non-Gates funded perspective to what the ‘R’ subject may be? The National Writing Project has their opinion, ‘ agencies also realized that adding the arts to STEM is not enough. We also need to add the thinking skills embodied in reading and writing. STEAM may condense into STREAM!’ This project also states how the National Endowment for the Arts, the NSF helped with the ‘A’ in the “STEAM”. Refer back to the above STEM to STEAM articles to see how CCSS aligned both these groups are. In my researched opinion, it appears the STREAM, just like the other standards based education reforms, needs proper vetting BEFORE they are made into law, but more importantly BEFORE they are EVER introduced into our classrooms! !